Enamel finished steel bracket for mount extinguisher on walls, vehicles and boats. Corrosive resistant brackets handle heavy traffic and through usage locations. 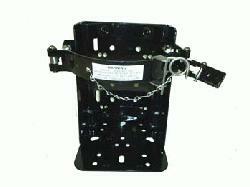 Vehicle brackets should be used in areas of rough vibration or heavy traffic. Required for U.S. Coast Guard approval.